While the auditor-general announces an investigation into the billions of dollars of Australian government off-shore detention contracts, the cuts to food rations by one Manus Island contractor is leaving asylum seekers hungry. NKW Holdings, the company responsible for welfare services at the Hillside Compound on Manus Island is one of the companies now being investigated over its $82 million contract. 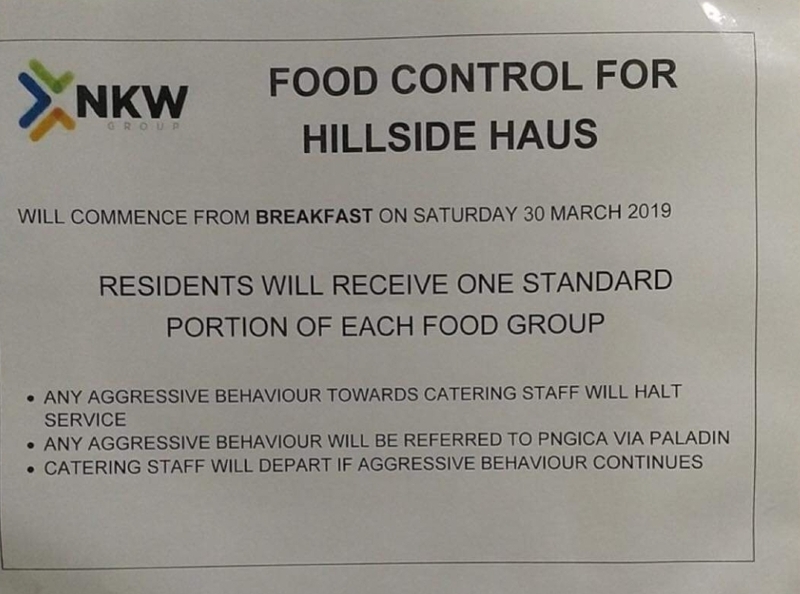 NKW Holdings chief executive Marlen Brunskill recently claimed that food it provided on Manus was “…at an international standard,” but NKW announced that food provided to Hillside residents would be reduced from Saturday 30 March (see notice). Since the announcement, the food has been restricted to one medium-sized plate (about 22 cm diameter) at each meal (photos attached). No extra food is allowed. The Hillside detainees have no income, and are not provided with any other rations. Complaints over the lack of food and ‘being hungry’ are growing louder and more urgent. NKW’s $82 million dollar Manus contract amounts to around $1400 per person per day, but that money is going straight into the pockets of the directors, not to provide food for increasingly hungry detainees. “A crisis situation is emerging at Hillside,” said Ian Rintoul, spokesperson for the Refuge Action Coalition, “You can’t cut back food and not expect trouble. “Hunger is adding to the stress of detainees many of whom are already sick and struggling with neglect and mental health problems. The cut in rations is likely to see more self-harm and suicide attempts as sick detainees are pushed past their limits. “Say Yes to Refugees” rallies on Palm Sunday (14 April) will take place across the country, to call for an end to offshore detention.